Coca-Cola Beverages Sri Lanka Ltd. (CCBSL) partnered with Eco-Spindles Ltd. and the Kataragama Committee in a PET plastic bottle clean-up and recycling program during the Kataragama Festival of July 2018. Approximately 100,000 plastic bottles (approx. 4,000 kg) were collected during the event. Utilising advanced recycling technology, Eco-Spindles will transform the bottles into brooms and brushes. The Kataragama clean-up is part of CCBSL’s ‘Give Back Life’ commitment – an ambitious goal to help collect and recycle the equivalent of every bottle we sell in Sri Lanka. The clean-up drive also raised awareness about the need for disposing litter in a responsible manner, and reusing or recycling as much as possible. The program was championed by volunteers from the Kataragama Festival Committee, particularly the Environmental Society, from the recycler Eco-Spindles and Coca-Cola’s Matara Sales Team who oversee the area, all working side by side. Gloves and poly bags used during this clean-up and collection programme were recycled too. 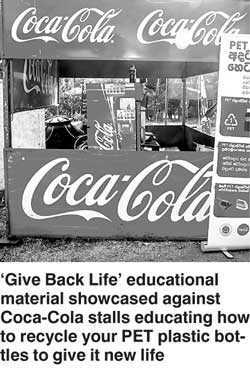 ‘Give Back Life’ continues to drive locally The Coca-Cola Company’s global ‘World Without Waste’ goal to help collect and recycle the equivalent of 100% of its packaging by 2030. This goal is the centrepiece of the Company’s new packaging vision in Sri Lanka.